Eucanuba is one of those brands that generates views at either extreme of pet ownership opinion. One camp swears by the brand as offering consistant high quality nutrition backed up with the scientific research to prove it works. The other swears at it for conducting the research upon which the food is formulated. 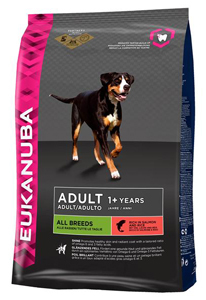 What you get with Eukanuba is a very large range of foods, from standard adult mainenance foods through their more natural range to prescription veterinary foods (which are also available online from the likes of Pets at Home and Pet Supermarket. Also within the range are breed and lifestyle specific foods. 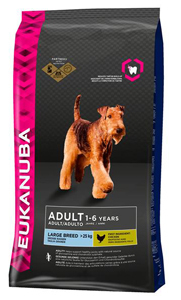 Like Iams, Eukanuba use a proportion of wheat in some of their recipes which is not one of the mose easily digested cereals. They also use the vague term 'animal fat' rather than matching the fat to the protein source. It is better to know what you are feeding, if for no other reason that it gives confidence that there is a consistency in the formulation. Expect to pay around £40 for a 12kg or 15kg sack, which is a litle higher than some equivalent natural foods. Based not just on quality of ingredients, but if it seems to offer value for money!